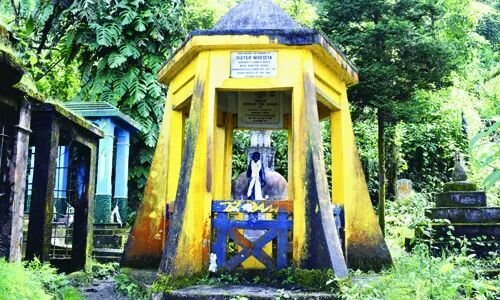 While the world celebrates the 150th birth anniversary of Sister Nivedita, back home, the crematorium in Darjeeling where she had been cremated and which also houses her memorial, is in a shamble. Thanks to the lackadaisical attitude of authorities of the Darjeeling Municipality, which is being run by West Bengal government for the past 5 months, the crematorium lies in a pathetic condition with no electricity for almost a month and debris and filth filling up the place. Sister Nivedita had breathed her last at the Roy Villa in Darjeeling on October 13, 1911. She was then cremated at the Darjeeling crematorium and a memorial was later constructed there. "Mukti Dham" the main crematorium of Darjeeling is located around 2 km from the town is steeped in history. It bears testimony to the rich legacy of the town. The memorials of Mahapandit Rahul Sankrityayan, Nepali poet Agam Singh Giri are present here along with a more than 110-year-old Chandrachur Shiva Mandir. The crematorium is also connected to the famous Bhawal case that has been immortalised in celluloid in the Bengali blockbuster Sanyasi Raja starring Uttam Kumar. The Bhawal case was an extended Indian court case about a possible impostor who claimed to be the prince of Bhawal and was presumed dead a decade ago. The Bhawal prince had been cremated in this crematorium. However, the present deplorable condition is all set to erase the rich history of this crematorium. Not only the heritage aspect, people are even finding it difficult to perform cremation services here. It has been more than one month that the crematorium is without electricity. The Darjeeling Municipality has undertaken a 30 metric ton bio gas plant at an estimated cost of Rs 8 crore. The plant is being built below the crematorium. "The executing agency has moved in heavy equipment for construction work including excavators which in turn have uprooted the two street lights that used to light up the crematorium. They have blocked all the drains of the crematorium and diverted the only water source that is available for cremation for their construction work. Despite repeated requests, they have turned a deaf ear," complained Sudhir Tamang, member of the Mukti Dham Sangrakshan Committee. Even the Municipality has remained apathetic to the complaints. "We have made verbal complaints as well as submitted written ones. Except assurances, nothing has been done yet," stated Tamang. The worst menace is a Municipality jhora (drain) that flows adjacent to the crematorium. With faulty construction of a culvert over it, the jhora gets clogged during rains and the filth flows on to the roads straight into the crematorium. "This has become a routine affair. There are heaps of filth all over the crematorium along with stench of excreta which overflows from the jhora into the crematorium. It defiles the sanctity of the temples and the crematorium," added Tamang. This time, too, the Darjeeling Sub Divisional Officer (SDO) who is the administrator of the Darjeeling Municipality assured that electricity would be restored. "We will restore the electricity within a week," assured Avik Chatterjee, SDO, Darjeeling. He, however, did not have any answer to the overflowing jhora. "Whole life we have to struggle. Even after death there is no peace. How can last rites be performed under such conditions," questioned Sanjiv Pradhan, a septuagenarian resident of the Hill town. By Amitava Banerjee, Millennium Post.